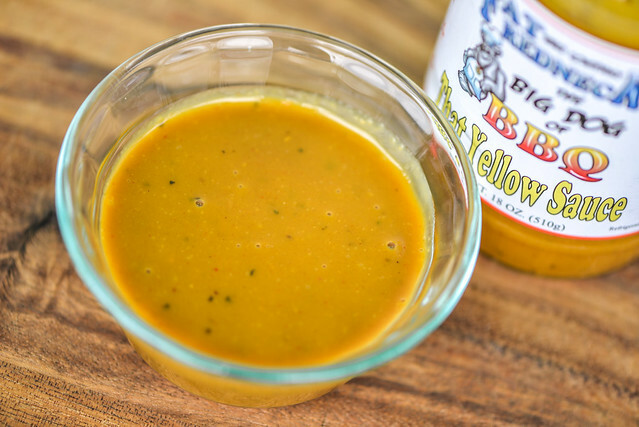 A nicely balanced and well layered mustard sauce, That Yellow Sauce delivers waves of sweet, tangy, bitter, and spicy that do a little better out of the jar than on the grill. 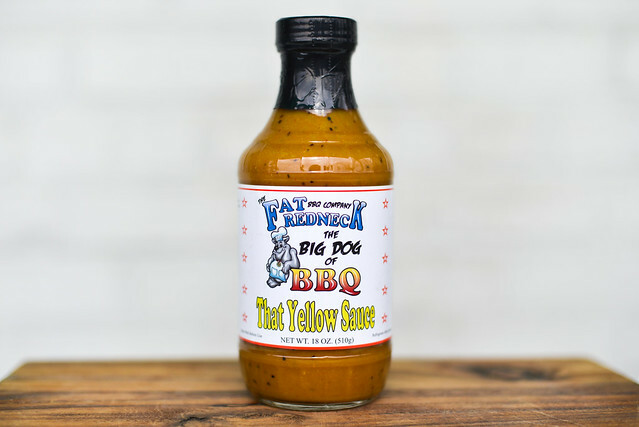 Randy Gowen of The Fat Redneck BBQ Company out of Snellville, Ga graciously sent me a bottle of That Yellow Sauce for a review. So, exactly what is That Yellow Sauce? 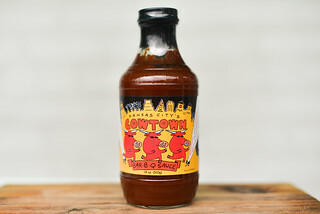 It's a mustard-based barbecue sauce first cooked up by Randy's barbecue company—The Fat Redneck—in 2009, a year after he was pushed by family and friends to start up a barbecue business. In 2010, The Fat Redneck expanded into competition and currently competes in GBA and KCBS events in Georgia and Florida. A strong mustardy bite fills the nose on first smell, with a strong hit vinegar that results in a light singe. Beyond those two heavy hitters that give the sauce a slightly bitter and tangy character, there are some ancillary elements also in play. The pungent Worcestershire is clearly at work here, as well as a deep sweetness that points to molasses as a sweetener. A peppery kick hints at the a heat that lingers below the surface as well. This sauce runs medium-thin, flowing in a quick and steady stream off a spoon, and leaving only a light coating left clinging. It's a very smooth sauce with a bit of a glossy sheen. Even through its opaque, mustard yellow color, it's easy to make out the plethora of spices within, including black and red pepper specs. The sweet start to this sauce is a bit deceiving, because once that mustard and vinegar start to hit—and they hit fast—it is nothing by tangy heat, with a little bitterness. The mustard and vinegar get equal weighting, and while they can easily both be overpowering flavors, the layers beyond those two still have room to play. Like with the aroma, its Worcestershire that is third in line and comes out after the sauce has had time to settle in. It's only when the sauce starts its retreat, that the peppers ramp up and begin to tingle the tongue, and then end with a heat that, along with the vinegar, leaves the mouth with a lingering light burn. On the grill, this sauce coated the chicken nicely and baked in quite well. Over direct heat though, the sauce burnt quicker than normal, leaving a lot of char on the side I didn't turn fast enough. The sauce's mustardy character was turned up a notch after being cooked. 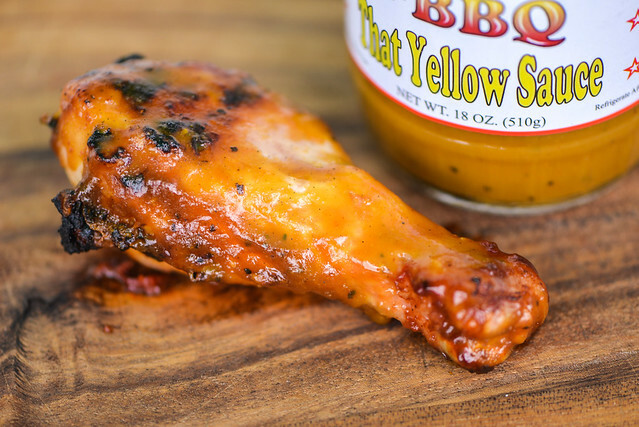 The little sweetness out of the jar was in retreat, leaving the mustard and vinegar to define the chicken leg as mainly tangy and bitter. It retained its nice spice at the end, which built up to a more prominent heat after multiple bites. I used to be a mustard naysayer, but have slowly been brought over the side of mustard connoisseur. 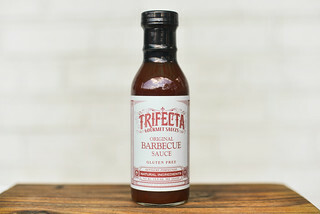 So I really dig these mustard sauces I get to try, and enjoy how they each tackle the unique bite, bitterness, and heat of mustard as part of the barbecue sauce formula. Out of the jar, That Yellow Sauce gives a nice balance between mustard and vinegar, with just a touch of sweetness and light hit of heat that I think most people would enjoy. After being cooked though, the scales tipped more in mustard's favor, and I while I enjoyed that change, I think just a little more sugar would be needed to make it more universally appealing. 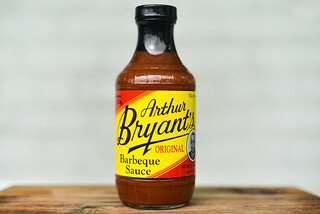 That leads me to recommend That Yellow Sauce as a condiment over grilling sauce, where you get the full range of sweet, tangy, bitter, and spicy flavor that would liven up a plate of pork or dress some slaw in style.